Social mobility is being able to improve your life, whatever your background, whether it’s disadvantaged or more affluent. One of Civil Service Local’s aims is to empower people to become more independent and able to overcome challenges, so that where they start in life shouldn’t determine where they finish. So at out first Social Mobility Discovery Session three speakers explained what their departments are doing to improve the life chances of people in the region. to ensure everyone fulfils their full potential in a rewarding career. The Government has designated 12 communities where social mobility is particularly low as Opportunity Areas, where partnerships are formed with local bodies including schools and colleges, businesses and local authorities. DfE’s Unlocking Talent, Fulfilling Potential action plan, which aims to improve social mobility through education, is a vital part of the strategy to improve life chances. Another barrier to social mobility is a lack of knowledge about the world of work. Drew Morris, the Head of Social Mobility in the Ministry of Justice spoke about a departmental engagement programme with schools in disadvantaged areas near MoJ offices. 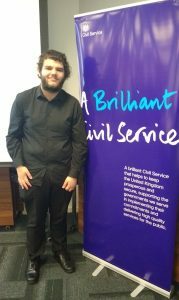 It raises students’ awareness of the possibility of a Civil Service career in their hometown, while the department’s ‘Step into Justice’ programme gives young people the chance to sample life in an MoJ office, from a day to two weeks. Drew emphasised that the approach isn’t just about outreach, but also inreach: MoJ employees from disadvantaged backgrounds have access to mentoring and sponsorship by senior leaders to help them progress in their careers. 37% have achieved qualifications while in HMRC, evidence of how the department is empowering staff to improve their education, which in turn can lead to improvements in social mobility. The insight from this survey will help drive HMRC’s social mobility strategy in the future. One of the session’s attendees, Corey Rae, an apprentice with the Department for Work and Pensions (DWP), perfectly illustrated how joining the Civil Service can positively affect the life of someone from a disadvantaged background. Corey hopes to get a permanent post after his apprenticeship ends, but says that even if he doesn’t, "it will always be a life-changing experience for me." At the end Paul Bruzzese from CS Local offered attendees the chance to turn this learning session into action. He asked them if they'd like to form a network to help continue their journey, not only learning but actually doing something to change people's lives. After the event Drew Morris agreed to sponsor the network and is looking forward to helping them achieve great things. If you've been inspired by Corey’s experience or you just want to improve social mobility in your region and your department, contact paul.bruzzese@cabinetoffice.gov.uk to join our new network. And yet there are those who claim that the education system is overly focussed at preparing children for the workplace. 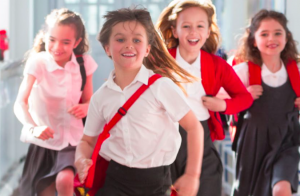 For instance, Joan Smith wrote back in 2011: "Encouraging growth in 'soft' subjects is linked to the notion that education is basically about preparing young people for work, an idea that isn't necessarily compatible with preparing them for life".